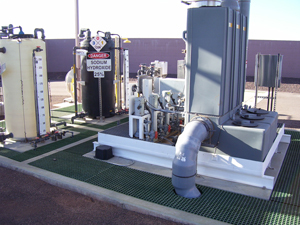 In 2009, the city of Phoenix needed to install a walking surface at a lift station that houses a wet scrubber for foul air treatment. The station serves not only a senior living facility, but also the nearby Musical Instrument Museum. The museum is a 190,000 square foot facility that houses more than 10,000 collectibles related to music. The chosen solution was sold by Molded Fiber Glass and submitted by Jacobs Engineering, whose design incorporated 1.5” DURAGRATE® molded grating. Strongwell’s DURAGRATE® has high resin content (65%) that will provide the station extended maintenance-free performance and the lightweight panels are also very easy to fabricate. Additionally, non-corrosive, light weight, and strong EXTREN® fiberglass profiles were selected for subsurface structural support. The Design Engineer, David Holman with DE Associates, the Sr. Resident Engineer, James Shane from Jacobs Engineering Group, and the city of Phoenix were all pleased with the results and performance of the FRP products. These photos, taken in 2011, show how DURAGRATE® and EXTREN® have withstood the corrosive environment in the last two years.